The relief of Belgium was not a matter of pouring into that country a stream of supplies for a large number of people suddenly destitute, as is the case when a region is devastated by flood or earthquake; it was a problem of provisioning a whole nation (and part of another), highly industrialized, densely populated, and suddenly cut off from those external markets in which it sold its products and from which it drew its raw materials and eighty per cent of the cereals it normally consumed. It was not merely the poor and the victims of military devastation, who had to be fed. Refugees and workers deprived of their employment by the sudden war were naturally the first to feel the effects of Belgium's commercial isolation; but in a short time well-to-do and poor alike faced the common threat of famine. During August and the first week of September the battle line swept across Belgium and into France, halted at the Marne on the 10th September, surged back to the Aisne, and then solidified in a double line of entrenchments from Nieuport on the Channel to the Swiss border. North and east of this line German forces occupied and ruled 20,000 square miles of Belgian and French territory with a population of over 9,000,000. The local food supplies of these regions, under normal conditions seriously insufficient, were reduced by military activities. The invasion came at harvest time; crops were destroyed, food was confiscated, and grain left unharvested in the fields in the confusion and panic of the first weeks of war. First the great industrial centers like Brussels, Charleroi, Mons, then progressively the smaller towns felt the bottom of the barrel of their food reserves, until by October it was clear that the entire country, except the relatively unimportant agricultural districts, would within a few weeks be starving. The task of the relief organizations that intervened at this desperate moment was at first, by emergency shipments, to avert the disaster immediately threatening, and subsequently to organize a program of food imports, and eventually of clothing, which added to the local products would preserve the people of Belgium and Northern France in health. The accomplishment of this task involved more than estimating the normal consumption, deducting the local production, and sending out orders in the food markets of the world to make up the deficit. As will be shown later the local produce also had to be taken under control and rationed in order that injustice should not ensue in the face of insufficient supplies. Obstacles of all sorts intervened. There was no possibility of providing for normal consumption, and to maintain even the minimum of subsistence involved the directors of the C.R.B. in an incessant battle that lasted through four arduous years and that always seemed on the point of being lost. The first engagement in this struggle to maintain a program was over the matter of finance of which there was practically none at the beginning of the operations. (34) Then came restrictions of the Allied Governments on the quantity and character of C.R.B. importS,(35) and finally the shortage of food in accessible markets and the shortage of shipping resulting from submarine activities and other causes. (36) Each of these engagements, though constituting but one in the series that made up the general battle to maintain a program, was of such importance that had it been lost the feeding of Belgium would have failed. Monthly needs Belgian population, minimum 60,000 tons wheat, 15,000 tons maize, 3,000 tons rice and dried peas. The American Ambassador informs me today that the American, Spanish, and Belgian Committee, assuming that a permit to let food supplies go to Belgium would allow them to export food from here, and knowing that the need is great, have already purchased £30,000 of foodstuffs and chartered a Dutch ship to convey them to Rotterdam. They now find that the export from this country is prohibited. They would be quite willing to replace these foodstuffs by others, imported subsequently. There are cargoes of wheat now on the Atlantic, on their way to British merchants. Would the Committee be permitted to buy any of these cargoes and divert them to Rotterdam, without their being brought here at all? There are cargoes of rice from India to Great Britain destined for the United States. Might the Committee buy some of these which are now on their way, and send them to Rotterdam instead of to the United States? There is no large amount of food to be bought in Holland. The Ambassador asks whether, when food is imported subsequently from the United States for the Belgian population, the food may be stored in warehouses here? The Committee would propose to send it only in small quantities to Belgium; so that, should the Germans, in spite of the assurance of the German Commander, confiscate any of this food, they would be able to detain the bulk of it here at any time. The American organisations and some wealthy men are anxious to send food to Belgium, and have already sent £12,000 here to be used for this purpose. The American Ambassador will tell them not to send money in future, but to despatch food direct from the United States. He asks whether it could not be sent in British ships from the United States, as well as in neutral ships? I have told him that with the Germans at Ostend, I doubt whether we would insure British ships on the way to Rotterdam; a British ship might be captured by the Germans. I have had occasion on various opportunities to impart to the Commission for Relief in Belgium the increasing need of our people. The monthly consignments are hardly sufficient to satisfy the demands of our Provincial Committees. 1) Wheat and flour. The consignments should continue in the existing proportions, which are a strict minimum (60,000 tons a month). 2) Lard and bacon. It is necessary to buy about 1,000 tons a month (500 tons bacon and 500 lard). Under the circumstances the National Committee does not keep to the limit of a price of 1.90 frs. to 2.00 fixed previously, but it asks that you should buy under the best conditions. 3) Rice. Besides the usual arrivals, it would be desirable to receive a large boatload of this product at the end of May and again at the end of June. 4) Peas and beans. It will be necessary to continue the imports in the existing proportions. 5) Maize. If it is possible, it would be desirable to purchase more maize before the next harvest, and above all white maize which will give white flour; if this is not possible, to take some measures to import a sufficiently large quantity of this product, until the beginning of the next harvest. 6) Potatoes. The National Committee will take as much as you can send until the beginning of the next harvest, say the end of July. Failing fresh potatoes, the Committee asks you to buy dried potatoes and potato flour. I confirm this request; but I should be glad to know what are the prices of these products. The Provincial Committees praise the qualities of dried potatoes to me, but as the quantity put at their disposal came from gifts, I have no idea of their price. 7) Salt and dried fish. I requested the Rotterdam office to buy salt and smoked fish, and as a trial to make a special consignment for Hainaut. If this first experiment is a success, the National Committee will want other large quantities of these products. One could perhaps buy it, instead of in Holland, in Norway or Sweden, or Scotland. I wish to draw your attention particularly to this kind of food, which is one of the most nutritive of common foods. 8) Meats. The Provincial Committees insist on receiving meat at reasonable prices. Failing a proper means of transportation, the importation of frozen meat is impossible unless your London Office could charter a special boat as far as Brussels, a boat which would at the same time serve Antwerp. But, even in this case, the rest of the country could not be supplied with frozen meat. In any case, I think it necessary to ask you to order some American salt meat. They mention particularly meat in casks, as being possible to deliver at very low prices. It should be understood, however, that I place no limit for the present, either on the kind of meat or the quantity ordered, so long as the prices are advantageous. It would be best to buy, as is best for the interests of the Provincial Committees, such salted meats as you would judge would suit our people best. I know, dear Mr. Hoover, that you will consider this question with the same activity and untiring devotion, which you have proved to us so often; and thanking you once more, I beg to remain. This request for an increased program of importation including supplies of new categories such as fats, meats, potatoes, et cetera put a new strain on the financial resources of the Commission, to which in April was added the additional requirement of from 15,000 to 18,000 tons for the 2,000,000 people in occupied French territories. (43) At the same time the contributions in kind, which had provided for nearly one-fourth of the imports, could no longer be depended upon to provide for this proportion of the needs. Fortunately the negotiations for government subsidies were successfully concluded in February. But even before he was certain of success in these negotiations, Hoover had increased the Commission's purchases in anticipation of the new requirements. The Commission was able, therefore, to deliver 110,000 tons of supplies at Rotterdam in April and to maintain during May and June monthly deliveries of 100,000 tons and thus provide for the French territories without reducing the deliveries to Belgium. Studies of our people indicate we could handle two million French people on supply of thirteen thousand tons wheat, twelve hundred tons beans, five hundred tons bacon, twelve hundred tons rice per month. This implies smaller ration than Belgium and could be managed on subsidy of three hundred thousand pounds per month. We can probably procure enough supplies here in addition to what we have now available; therefore what we want is this money, and in view of critical condition cereal market we should have the money placed at our disposal at once so as to be able to procure and pay for three months' supply and thereafter three hundred thousand pounds per month in order to provide for the third month forward, this system to continue until we have provided for month of July, that is, March, April, May, June, July, five months, making total one and half million pounds. We have during last two months and in continuance of our work during March depleted our Belgian supplies by an amount equal to three hundred thousand pounds, which I therefore include in above budget, this sum in respect of March. 2. In the matter of flour it is considered that the consumption until harvest is about 50,000 tons per month or about 55,000 tons of wheat. It is considered that, as the harvest will be available in September, an additional purchase of 12,000 tons will be sufficient until October 1st. That in the matter of the ratio of wheat to flour, the cities of Antwerp and Brussels shall be provided with white flour, until the whole of the present purchases are exhausted, and unless three months' notice is given to the contrary, the Commission will then proceed to supply Brussels and Antwerp with wheat. It is considered there is likely to be little demand in Belgium owing to the local production, and therefore no further engagements should be made. 5. In the matter of bacon, it is decided that in the future this commodity should be purchased for its meat value (i.e. lean sides), and therefore the best average quality is wanted. It is considered that the Belgian consumption is 1,500 tons per month. It is noted that of the purchases already made, a considerable portion are fat backs, but no more of these are to be purchased. It is observed that hereafter all prices should be taken at net weights. 6. In the matter of lard, it is believed that it is unwise to purchase substitutes, and that only pure lard in tins of various sizes should be purchased. It is observed that hereafter all transactions should take place in net weights. 7. In the matter of maize, it is considered that the present purchases will last until September 1st; that 20,000 tons should be averaged for September; the whole subject to be taken up later. 8. As it is absolutely necessary that the stocks of imported foodstuffs in Belgium should not exceed a 30 days' supply, it is imperative that there shall be a competent stock-taking of all the warehouses at the end of every month, and that these results should be in the hands of the Brussels office by the fifth day of the succeeding month. Rotterdam can then be advised as to the amount of the different commodities which should be consigned to the different provinces or shipping destinations in order to supply the consumption during the month and to leave the warehouses at the end of the month supplied with approximately one month's supplies. 9. In order that the C.R.B. may purchase supplies in the primary markets and thus avoid the overpayment of emergency purchases, it is absolutely fundamental that any change in the theoretical program should be advised three months in advance. 10. It is decided to reorganize the statistical department by adding an American delegate, who can travel about and collect the necessary statistics and present them in form to control the supplies and shipments, and to furnish the C.R.B. in London with the data they require. 11. It is considered essential that permanent warehouse space should be taken in Rotterdam, where at least one month's full supplies for Belgium and France can be carried in permanent reserve. 12. It is decided that the C.R.B. shall readjust its prices to the C.N. every two months, beginning July 1st. It is the general intention that the C.R.B. should make approximately 10 per cent profit on all commodities for the benefit of the destitute, but in the matter of wheat, the price must be adjusted in consultation with the C.N. It is also intended that minimum profits should be made on wheat and bacon and larger profits on peas, beans, and especially rice and maize. The profits earned from the sales to the well-to-do people form a tax for the benefit of the poor, and should, if possible, be maintained at about 2,500,000 francs per month in order that the soup kitchens may be properly supported. With the end of October 1915 the Commission had completed its first year. It had delivered in Rotterdam 980,000 tons(45) of relief supplies valued at $69,000,000, and though there had been some undernourishment the people in Belgium and Northern France had escaped the famine which had cast its shadow over them twelve months before. Bread grains and cereals formed 90 per cent of the importations into Belgium, yet the Commission had found it necessary to supply some fats so that importations in combination with the local produce would result in a balanced ration for the 9,000,000 people. In Northern France the Commission found it immediately necessary to broaden its category of importations due to the dearth of many articles. At a later date the same necessity arose for Belgium. Gifts in kind to the generous total of 93,000 tons and a value of over $9,000,000 formed part of the Commission's importations. Full gift cargoes of wheat and flour had been transported, and these with the gifts of maize, rice, peas, and beans entered readily into the machinery of rationing set up by the Commission. Of greater difficulty in handling were the 12,000 tons of miscellaneous groceries donated during the first year. The call for gift clothing had resulted in some 2,000 tons and this had been renovated and distributed to the destitute. As had been anticipated the monthly donations in kind had fallen off considerably by the end of the first year. The adoption of the program above for the winter of 1915-1916 followed a series of events which marked the transition of Belgian relief from its original, temporary character to a more permanent basis. In June 1915 Hoover had secured from the German authorities guarantees, acceptable to the Commission and the British Foreign Office, which reserved the Belgian harvest of that year for the civil population. (46) At about the same time the British Government reviewed the whole question of Belgian relief and made very definite stipulations concerning the Commission's activities. (47) Of particular interest here was the limitation of the Commission's Belgian imports to wheat and wheat flour (which could not exceed 60,000 tons of equivalent wheat per month before the harvest and was to be reduced to a minimum supplement of native supplies after the harvest), peas, beans, rice, bacon, lard, and maize (for human consumption only). The quantities of these commodities other than wheat to be imported were fixed from time to time in agreement with the Foreign Office. These restrictions determined the "permitted program" which the Commission might not exceed. As a result of our conversation this afternoon, I think it well to put on paper the present situation. At present your staple articles of importation into Belgium are wheat, rice, bacon, lard, beans, and maize. Besides these, we have authorized you at various times to import certain articles which you class as "produits divers," i.e., soap, coffee, sugar, oleomargarine materials (to be used solely in a factory to be controlled by you), butter, fish, preserved meat, salt, groceries, cheese, dried fruit and vegetables, yeast materials, and cocoa. In regard to certain of these articles I understand that you have not availed yourself of our authorisation at all; in regard to others very little. Finally, you have been authorised to import certain purely charitable relief supplies, i.e., medical supplies and clothing for the destitute. In view of action by the Germans which appears prima facie to infringe their undertakings, and in view of grave doubts which have arisen as to whether certain of these imports do not in effect constitute a replacement of articles bought or otherwise taken by the Germans, it is necessary to restrict your activities for the moment. You have already been asked, and have undertaken, to ship no further consignments of meat, bacon, lard, or other pork products from Rotterdam either to Belgium or France until further notice. I must now ask you also to stop all shipments from Rotterdam to Belgium of soap, coffee, sugar, oleomargarine materials, butter, salt, groceries, cheese, dried fruit and vegetables, and yeast materials. The only shipments which you may still make to Belgium from Rotterdam will therefore be wheat, rice, beans, maize, fish, and cocoa, and medical supplies and clothing for relief purposes. Your programme of importations into Northern France has been somewhat different, namely: wheat, rice, beans and peas, bacon, lard, sugar, salt, coffee, soap, and condensed milk. Besides this you have been importing certain quantities of salted meat. As the conditions in Northern France are somewhat different, I do not want to ask you at the moment to cut off any importations into France from Rotterdam, except the meat, bacon, lard, and all pork products as already arranged, and also soap. The only importations you will make into France for the moment will therefore be wheat, rice, beans and peas, sugar, salt, coffee, and condensed milk. I am not sure at the moment whether you have been importing any condensed milk into Belgium, but if so this may continue if necessary to supply destitute children. I shall be glad to hear from you that you are prepared to give an assurance to the above effect. I do not want to close this letter without saying, what you already know, that these restrictions on your activities arise out of the exigencies of the situation and imply no loss of confidence in you or the other members of the Commission. With respect to your letter requesting that I should review the whole question of imports, I believe it is desirable that I should do so in two separate memoranda, one as to Northern France and the other as to Belgium, as these are economically and administratively entirely separate problems. As to all these lists or any part it must not be imagined that we will succeed in importing precisely these monthly quantities. These amounts are consumption and we must carry stocks both in Belgium and Rotterdam. Wheat.---The available native wheat supply, which is under our control, affords us about 13,500 tons of wheat per month. It is therefore necessary for us to import about 54,000 tons per month, in order to give a 250 gram flour ration to the population. Owing to the lateness of the harvest all over the world, our stocks in Belgium have run down until we have, aside from stuff in transit, today only an average of two days' supply in our warehouses in Belgium, and it is therefore necessary for us to build up some stocks in the country, which implies larger importations in the immediate future, with, of course, a slackening off towards the end. Lard.---In order to enable us to give a ration of 33 grams (1 oz.) per diem, it will be necessary to import 7,000 tons of lard per month into Belgium. Bacon---In order to give a ration of 16 1/2 grams (1/2 oz.) of bacon per diem to Belgium, it will be necessary to import 3,500 tons per month. Maize.---Maize is used partly for human food, in the form of a porridge product called cerealine, designed for children, while the refuse and the rest of the maize is used for fodder. The amount which we have set for ourselves for this purpose is 20,000 tons per month. This represents half the normal importation into Belgium and is used largely for poultry purposes and the feeding of municipal livestock. Rice.---We have, during recent months, been importing about 5,000 tons of rice per month for Belgian account. It is issued as a ration but is participated in only by the more indigent portion of the population and it has not covered the whole of the people as a ration of 60 grams of rice per them would require a larger quantity than this. Beans, peas, and lentils.---Our requirements are about 4,000 tons a month. The demand varies with the season. During the summer we do not require the whole of our imports. These are in stock and are now coming into use again and we shall need to resume imports on this scale at an early date. Condensed milk.---We shall need to be prepared to import during the winter, perhaps 1,000 tons of condensed milk per month for Belgian account. It is used chiefly for the support of the children and is made an eminent necessity by the natural shortage of fresh fodder during the winter. Medical supplies.---We import an irregular amount of these materials. Clothing for the destitute.---We are begging and buying considerable amounts of cloth, boots, shoes, old clothes, and every sort of wearing apparel, and are giving it away to the absolutely destitute only. Petrol and tires and spares---We are entirely dependent upon imports for the running of our automobiles and we simply cannot do our work without these supplies. We have had a permit for 5,000 litres a week of petrol, which is an undersupply. Yeast materials.---We used to import a certain amount of barley, rye, and malt radicles for yeast making. This amounts to probably 1,000 tons of stuff per month. Preserved and frozen meat.---The various Belgian communities are clamoring for the importation of beef products, and this amounts to, presumably, a total of 1,000 or 1,500 tons per month of each material. Cocoa.---This item probably amounts to 1,000 tons of cocoa or cocoa beans per month for the manufacture of chocolate. Coffee.---The Belgians are anxious to secure the importation of at least 2,000 tons of coffee per month, the depletion of stocks in Belgium making this imperative. Sugar.---There appears to be available about 5,000 tons of sugar per month to the Belgian population from native production, against a normal consumption of about 10,000 tons a month. Many quarters of the country are already short of sugar and the Belgians are anxious to import at least 2,000 tons a month. Soap.---The exhaustion of oil materials in Belgium makes the local manufacture of soap inadequate and the Belgians are anxious to import at least 1,000 tons of soap per month for their account. Oleomargarine materials.---We have prepared a factory for handling imported components for Oleomargarine, and something like 1,000 tons per month are wanted to stem the butter famine. Butter.---The Belgians wish us to import butter, in what amount we cannot estimate, probably not exceeding 500 tons per month. Preserved fish.---The Belgians wish us to make arrangements to import dried herrings, tinned salmon, and other forms of fish. I do not know how much this would run into and amount to, but I suppose, say, 300 or 400 tons. Dried fruit and vegetables.---Under this item is the ordinary form of dried fruit-raisins, prunes, apples, etc. Comestible oils.---This item is for salad oil and is made up of either pure olive oil or with peanut and cottonseed substitutes, and the Belgian requirements seem to run into 400 tons a month, as a minimum. Linseed cake.---The Belgians desire to have linseed cake imported for fodder purposes and we had a formal permit for 10,000 tons. Sugar refuse.---The Belgians desire this also for fodder purposes and we had a practically unlimited right to import this from Holland. Salt and groceries generally.---You will recollect that under the "Produits Divers" arrangement we had the right to import various articles comprised under these heads, including tea. Potatoes.---There are apparently ample potatoes in Belgium, but they cannot be obtained from the peasants in view of expected famine prices. If we could import 10,000 tons per month for a while we would smash the market. Cheese.---The Belgians wish to import up to 2,000 tons per month from Holland. ........a. Wheat........b. Maize.......c. By agreement with the Germans. Potatoes.---You will notice that. we have introduced here the importation of potatoes. This is a little involved. At the present moment the Belgian peasant is holding up his potatoes and refusing to bring them out, in anticipation of famine prices. Last year we obtained a permit from the government to import potatoes into Belgium under similar circumstances, and by the introduction of 17,000 tons of potatoes we broke the market from 35 centimes a kilo down to 12 centimes, and held it there. There is a superabundance of potatoes in Ireland going to waste today and I have no anticipation that we should need to import continuously for Northern France if we could once demonstrate to the Belgian public that potatoes could flow into the country. Cerealine.---Cerealine is a sort of porridge product which we make ourselves in Belgium out of imported maize. It is chiefly designed for the use of the children. Carbide.---In the country outside the larger cities which are lighted by electricity, there is absolutely no illuminant, and people are going to bed at five o'clock in the afternoon. There are in circulation all over the country small miners' acetylene lamps, and it seems to us there could be no objection to importing carbide, as there is an ample supply of this material for all German purposes flowing into Germany from Scandinavia, or supplies of German production. We have managed to buy locally some carbide of Norwegian origin, but there is an insufficient supply. Salt (1,320) . . . . . . . . . .
Sugar refuse . . . . .
Groceries . . . . .
Yeast materials . . . . . Clothing for destitute . . . . . Petrol, tires, and spares . . . . . I am sorry to involve you in so many difficulties, but I have two points on which I must trouble you. First, as to the "Livingstonia." I find that some of our people don't want her cargo to go on from Rotterdam till the final consideration of the whole question this week. The Admiralty have consequently held her up in the Downs, and I have said that, if she is released, I will see that the Commission does not ship her cargo from Rotterdam until this decision is reached. As I hope for a decision not later than Friday, this should make practically no difference. Will you see to it? As a matter of fact this cargo, with what you had in stock at Rotterdam and with the remainder of the "Levenpool" cargo and the 1,450 tons of bacon and lard you have bought here, will amount to considerable more than the 6,900 tons a month which is now our temporary basis. Second, as to the condensed milk. Our people are firm on the point about the return of the empty tins. The danger does not arise from the amount of metal in the tins but from the tins themselves. Germany is very short of tins, so much so that she is sending out empty tins to be refilled with preserved meat, etc., in neutral countries, and is collecting empties high and low. Now I quite see that this means a considerable amount of new organisation on your part, but the re-collection of these tins should present no huge difficulties in itself. Each commune can collect them fairly easily from the consumer each time the latter applies for a new ration, and all the way up the chain from the communes back to Rotterdam you must have a large number of lighters and lorries returning empty which could be used to carry these empties. An arrangement with the N.O.T. (48) would be necessary in order to secure that all the empties brought out should fall again under their control, and we are instructing Sir A. Johnstone to consult with the N.O.T. and Mr. Young on this point in connection with the milk he now wants authorisation to export from Holland. As some compensation for the trouble all this will entail on you, I submit that you might get something from the resale of these empties in Holland or here. Will you think over this and let me have your views? Meanwhile, can you take steps to have the Commission in Belgium and France keep a careful eye on the Germans and stop them at once if they try to collect tins from house to house as they are doing in Germany itself? On various occasions I have felt obliged to address lengthy communications to you as patron, in your unofficial capacity, of the Commission for Relief in Belgium, A very critical situation has now arisen regarding the affairs of that Commission, and I must therefore put before you briefly the views of His Majesty's Government. 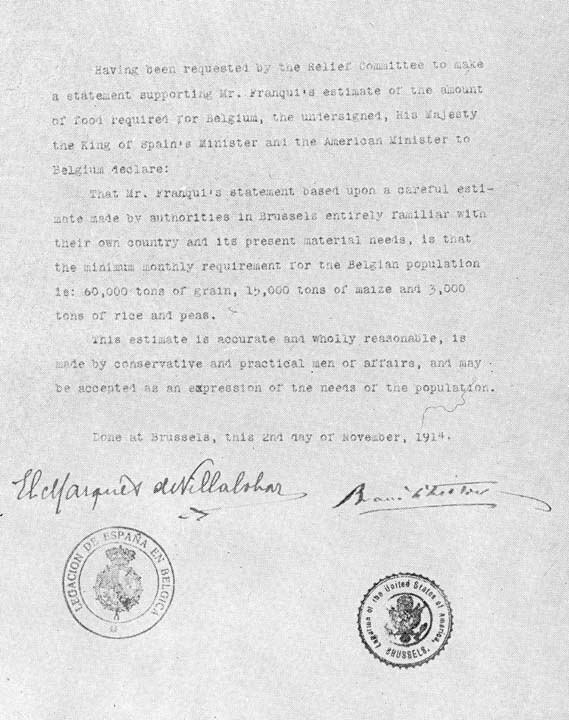 On December 31st, 1914, the German Government assured the United States Ambassador at Berlin in writing that they would thenceforward prohibit the requisitioning of "food or forage of any kind whatsoever which would require to be replaced by importations by the American Committee for Belgian Relief." This undertaking has no doubt in large measure been observed in the letter; it has never been observed in the spirit, and even the letter has frequently been violated. I need give only one instance of direct infringement. Between November 1914 and July 1915, inclusive, the Commission distributed in Belgium six thousand six hundred and seventy-five tons, seven hundred and thirteen kilos of bacon and lard. Yet the German authorities have requisitioned tallow in Belgium and between June 1st and July 10th four thousand and seventy tons of fats and oils were shipped from Belgium to Germany. It is not, however, of such direct infringements that I desire to speak now. The Germans have interpreted their solemn undertaking of December 31st as covering only such articles as were actually specifically named in the Commission's list of imports, and they have drained Belgium of all subsidiary articles which serve to diminish the consumption of staple foods. They have done more. They have made no attempt to conserve native supplies even of those staple foods which appear on the Commission's list of imports and, where they have not requisitioned those native stocks, they have freely purchased them when thrown on the market, and have exported them from Belgium, either to Germany or to the army in Flanders. Owing largely to lack of fodder the stock of pigs in Belgium appears to have diminished by some sixty per cent, and a large part of this diminution must be attributed to purchases by the German Army. In the same way, cattle are being bought up on a large scale, and are being sent south to the army. The resources of agriculture are diminished by the export of phosphates and guano. Only recently large quantities of Belgian sugar have been exported to Germany. I am aware that the German authorities will adduce the comprehensive list of articles the export of which from Belgium is prohibited, as evidence that this account is inaccurate. But there is no reasonable doubt that exceptions are freely made to these prohibitions, in the case of exports to Germany, and it is also certain that they do not apply at all in practice to exports for the use of the German Army in France and Flanders. These are merely instances. I will not pause to go over article by article the resources of the occupied territory which have been steadily depleted, nor need I refer to the wholesale requisitions of goods of all kinds which took place at Antwerp after the fall of that city. I only desire to make clear the consistent German policy during the last twelve months. Needless to say, this policy has applied even more to industrial raw materials and manufactured articles than to foodstuffs. The German Government is reported to have recently made itself responsible for the statement that the economic condition of Belgium is nearly normal. I am astounded at this statement in view of facts which have become notorious. The textiles trades have either been deprived of all raw materials outright or have seen their finished products requisitioned in detail as they are completed. And what is true of the textile trades is true also of other Belgian industries. Moreover, Germany has invented a method of facilitating this process. She has exacted and still exacts a levy of forty million francs (40,000,000) a month from Belgium in the form of a special note issue. This levy provides abundant cheap currency with which Belgian products may be purchased, and the country is thus drained of its resources in exchange for worthless paper of German invention. The result of this process has been clearly seen in the last few months. The Commission, which had expected to be able to reduce its activities after the harvest, has increased them. It has made a series of new requests for import permits in respect of various fresh articles of food, and it has largely increased its importations of bacon and lard. It is planning to import large quantities of clothing for the destitute. This gradual expansion cannot continue, and within the last few days, as Your Excellency is aware, His Majesty's Government have felt themselves obliged to suspend temporarily the importation of various articles into Belgium by the Commission. The time has therefore arrived when the whole work must be placed on a more clearly defined basis. Your Excellency will recollect that His Majesty's Government undertook to continue to issue permits for the Commission's imports of wheat into Belgium on condition that the Germans reserved the native harvest of wheat and rye strictly for the civil population. You will also recollect that His Majesty's Government expressed their inability to give any similar undertaking in regard to any other articles of import, and that the whole arrangement was made subject to one fixed stipulation that "no foodstuffs shall be imported which will, in effect, replace any foodstuffs requisitioned or purchased in Belgium by the German authorities." I must now inform Your Excellency that His Majesty's Government can no longer tolerate the present position. 1. The export of all foodstuffs and substances fit for use as food, whatsoever, including livestock and fodder of all kinds, and also all fertilizers, seeds, and agricultural stock of every sort, shall be absolutely prohibited from the territory administered by the Governor-General. of Belgium to any destination whatever, with the one exception that the Commission for Relief in Belgium may be allowed to export to Northern France, for distribution there by them, foodstuffs of which there is a clear surplus over and above the present or future needs of Belgium. 2. The export of all articles of clothing and of all raw material for their manufacture shall be prohibited except to neutral countries, and then only after full provision has been made for the present and future needs of the civil population, including the destitute. 3. None of the articles above mentioned shall on any account be used by the German Army of occupation in Belgium. 4. These prohibitions shall be rigorously maintained without exception of any kind. 5. The Commission shall be allowed to exercise any control over the stocks mentioned in the preceding paragraphs which may be necessary in order to conserve them for the future, or make them available for the present needs of the population. If these steps are not taken His Majesty's Government will hold themselves entitled to reconsider their whole attitude towards the Commission, since its work will have become, through no fault of its own, a method of replacement instead of one of relief, and an encouragement to the Germans to deplete the resources of the country. In that case I shall have no choice but to publish the documents showing the conditions which have obliged His Majesty's Government to change their views. Our attention has been drawn to a notice in the Cologne Gazette of December 14th last stating, with reference to a communication made by the German Government to the Budget Committee, that in the spring of 1915 eighty thousand head of cattle were sent into Belgium to be pastured there and that similar action will be taken in the spring of 1916. As you are aware, the German Authorities have requisitioned the crop of oats and hay in Belgium. If there is sufficient pasturage in Belgium to support eighty thousand head of German cattle, any lack of meat in Belgium must be clearly due to the action of the German Government and, in the presence of this fact, His Majesty's Government must hold the German Government responsible for the supply of meat to the population of Belgium. Moreover, the Commission for Relief in Belgium is now allowed to import no fodder except maize to an amount of twenty thousand tons a month. As part of the resources of Belgium are apparently to be devoted to the maintenance of German livestock, a proceeding equivalent to the export of fodder which we have demanded shall cease, His Majesty's Government will be obliged to reconsider the permission given for the importation of this amount, and we must therefore ask you to import no more maize for fodder purposes until the situation is cleared up. There is no objection to the importation of maize for human consumption being continued. Without prejudice to the list we shall finally and permanently fix, the Board of Trade will probably now instruct the International Commission to allow the export by you of your 1,000 tons a month for Northern France. But as this authorisation depends absolutely on the soap being of the hard variety not containing ingredients fit for military purposes (the kind you now are buying here, I think), we want it to be understood for the present that you will buy all your soap in this country in order that we may be able to say at any time that we know that the soap is of the right kind. I feel all these various small stipulations must give an undesirable impression of lack of confidence in you, but I beg you to believe that this is not at all the case and that it is merely a question of our being able to vouch for things of our own knowledge and not on hearsay. I am directed to transmit to you the enclosed programme of supplies for Belgium and Northern France, to which it has been decided that your imports should for the present be reduced. This programme has been submitted to the French and Belgian Governments for their observations with an explanatory statement of the grounds on which it is based. I am directed to ask you to confine your imports within these limits till further notice, and in the case of all articles on the list you will of course only import when and as you are convinced that there is real need of them owing to exhaustion of native supplies. 250 tons of yeast materials. Medical supplies (not including rubber goods). 100 kilos of mineral transmission grease and motor-car accessories. The demands made by His Majesty's Government in their note of December 31st are here taken seriatim, with comments upon the replies made by the German authorities. 1. His Majesty's Government demanded that "the export of all foodstuffs and substances fit for use as food whatsoever, including livestock and fodder of all kinds, and also all fertilisers, seeds, and agricultural stock of every sort, shall be absolutely prohibited from the territory administered by the Governor-General of Belgium to any destination whatever, with the one exception that the Commission for Relief in Belgium may be allowed to export to Northern France, for distribution there by them, foodstuffs of which there is a clear surplus over and above the present or future needs of Belgium." a) That certain Belgian produce, of which there is a sufficiency in the country, and which Belgium normally exports, such as chicory, shall be exempted. His Majesty's Government recognise that there is some ground for this exemption, but they do not understand it in present circumstances in view of the German decrees of August 13th, September 16th, and October 23d ordering the seizure of all chicory roots and placing them under the control of the "Zentral-Einkaufsgesellsehaft für Belgien"; and in view of the notorious efforts made by the German authorities to buy up chicory, vegetables, and fruit for German use. The German authorities in fact place an export tax on chicory and only allow its export to Holland "on proof of corresponding imports from Holland provided the condition of the German market allows it." If Belgium is so rich in such vegetables, it is clearly out of the question that His Majesty's Government should continue to allow large quantities of beans and peas to be imported into Belgium while native produce is being exported. The utmost concession which His Majesty's Government can make in this respect is that the export of such produce shall be allowed to neutral countries after the Commission for Relief in Belgium and the Comité National have had full opportunity to purchase all that is needed for the destitute. b) That the German authorities shall still be free to take native foodstuffs by purchase for the use of the occupying army. It appears from this stipulation that the German authorities now openly and avowedly repudiate the guarantees given by the Under Secretary of State for Foreign Affairs at Berlin to the United States Ambassador on December 8th and December 31st, 1914, and General von Bissing's decree of January 21st, 1915, against requisitioning of foodstuffs and fodder. The promise of purchase in forced paper currency makes not the slightest difference to the fact of requisition. His Majesty's Government absolutely refuse to accept this proposal or to acquiesce in this attempt to make the Hague Conventions a charter of spoliation. c) That certain stocks, said to be the property of the German Government, shall be exempted and shall be immediately exported from Belgium. As the 3,000 head of cattle mentioned in the list of these stores are the only things stated to be of German origin, it is to be presumed that the remaining items are of Belgium origin. They thus furnish further evidence of the violation of the German guarantees against requisitions referred to above. The 27,400 tons of fodder mentioned are doubtless the product of the last Belgian harvest. His Majesty's Government raise no objection to the export of the 3,000 head of cattle, if these are in fact of German origin, but if any of the other articles are exported, the Commission's imports will immediately be reduced by an equivalent amount. The use of Belgian pasture for German cattle is absolutely inadmissible. When coupled with the wholesale requisitioning of the Belgian fodder crop, it represents an inhuman policy which, if continued, His Majesty's Government must publish for the information of the neutral world. 2. His Majesty's Government demanded that "the export of all articles of clothing and of all raw material for their manufacture shall be prohibited except to neutral countries, and then only after full provision has been made for the present and future needs of the civil population including the destitute." The German reply is confined to a guarantee of clothing or clothing materials imported by the Relief Commission. The German authorities can hardly have misunderstood the clear demand of His Majesty's Government for a guarantee of domestic textiles precisely similar to that demanded in the case of foodstuffs, fodder, etc. His Majesty's Government insist on that guarantee. 3. His Majesty's Government demanded that "none of the articles above mentioned shall on any account be used by the German army of occupation in Belgium." The direct refusal of this demand has already been dealt with above. Consent on the part of the German authorities is a condition sine qua non of the continuance of the work. 4. His Majesty's Government demanded that "these prohibitions shall be rigorously maintained without exception of any kind." It may perhaps be assumed that consent to this is implicit in the German reply, within the limits of that reply. 5. His Majesty's Government demanded that "the Commission shall be allowed to exercise any control over the stocks mentioned in the preceding paragraphs which may be necessary in order to conserve them for the future, or make them available for the present needs of the population." This is answered by a vague expression of willingness to concede the "control materially necessary." The object of the control demanded, so far as present necessities are concerned, is to make immediately available to the civil population and especially to the destitute such native products as pork and potatoes. His Majesty's Government attach no importance to words in this matter, but they cannot allow importations of such articles so long as the Comité National and the Commission for Relief in Belgium are unable, for whatever reason, to obtain existing native supplies. The German reply contains a list showing the increase of livestock in Belgium. Annexed to the present memorandum is another list showing a strange decrease in the number of animals slaughtered in Belgium, in all cases except cows. His Majesty's Government do not recognize such figures as signs of prosperity nor can they accept the German figures, but it is clear that, if, as shown on the German list, the pigs in Belgium have increased by fifty-six per cent, there can be no valid reason for the present high price of pork in Belgium and no need for importations of bacon and lard by the Relief Commission, since Belgium does not in ordinary times of peace, when her stock of pigs is apparently less than in war time, import any considerable quantity of such articles. His Majesty's Government therefore propose entirely to stop such importations unless within a fortnight the Commission can show reason for their continuance. Finally, the German reply is made conditional on undertakings from His Majesty's Government to leave the Commission complete freedom of importations and not to requisition ships chartered by them. If this condition were accepted, the German authorities would be free with impunity to turn every American out of Belgium and to impose all sorts of restrictions upon the grant of relief, such as are foreshadowed in one of the letters attached to the German reply. His Majesty's Government must therefore absolutely refuse to give any undertakings whatever beyond those already given, and they will certainly retain the right to requisition at any time any ship flying the British flag. It is unnecessary to draw attention to the extremely serious situation created by the German reply, nor to the urgency of securing a frank assent to the reasonable demands of His Majesty's Government in view of the extent of the infractions of previous undertakings revealed in that reply. It may be well to add that His Majesty's Government are in no way impressed by the anxiety displayed by the German authorities to ensure adequate importations by the Commission for Relief in Belgium in the interests of the Belgian population, nor will they be deterred by such expressions of solicitude from still further reducing the importations of the Commission below the new figures they have just been obliged to fix, if the German authorities delay any longer the conclusion of a proper arrangement. With respect to your enquiry as to the effective difference between the imports into Belgium as set out in the recent Foreign Office note and our previous quantities, we may give you the following notes. The principal difference lies in the restriction of fodder and fat imports, with a view to pressure on the Germans. The question of human food is inextricably entangled with that of food for animals in its results as to local supplies of meat, milk, butter, etc., and it appears to us that the Foreign Office note is based on the assumption that the present negotiations with the Germans for the effective protection of the cattle will not succeed. If they did succeed there would surely be no reason for putting restrictions on the import of any foodstuffs into Belgium so long as they are actually and advantageously consumed by the civil population. If we are to assume that the negotiations mentioned above will not succeed, the question becomes a matter of state policy as to the restrictions on certain commodities, in order to force an immediate consumption by the civil population of the whole of the animals, and you will agree with us that this is not a matter of dietetics. 1. A supply of bread to the whole population. 2. The limitation of all other commodities imported to the sole consumption of the 3,250,000 wholly or partially destitute people. This question is one of a somewhat more involved character than might appear on the surface and we do not think anything can be gained by going into it. We will do the best we can with this basis. We give you below a table showing the comparative distribution to the 3,250,000 under the program now proposed and that which we have had, in a general way, in use previously. We term one the "new ration" and the other the "old ration." *The yield for human consumption. The new ration [also includes] 500 tons of condensed milk [for children exclusively]. All experts differ on these points, but we are advised that the nominal minimum necessary to keep a population in health should be 2,500 calories. The difference between this and the amounts given above, i.e., 1,552 in one case and 1,865 in the other, must be made up from native foodstuffs, such as potatoes and vegetables. The whole question, therefore, degenerates into one simply of judgment as to what and how much the poorer classes in Belgium can obtain in supplement to the ration. As neither of these rations is sufficient without some such supplement, our judgment is that the larger ration is nearer the minimum which the people can possibly supplement with native supplies. There is another general point in the whole of this thing and that is that there seems to be some misconception about forcing the consumption of native meat. If the whole imports of bacon and lard were suppressed tomorrow very few of the 3,250,000 lower strata of society would ever consume any of the native animals, as these products are out of their reach and in consequence nearly the whole of these people would be denuded of fats. a) That we group the whole of the cereals, wheat, maize, peas, beans, and rice, and place the total imports of cereals at 70,000 tons per month, exclusively for human consumption (except the milling by-products), leaving it to our judgment as to what proportion of each cereal we shall from time to time send in. This would be an increase of about 5,000 tons per month on the cereals permitted by the recent note, so as to include rice, which has been eliminated. b) We would suggest an increase of the bacon and lard by 1,600 tons per month. This would permit a ration of 40 grams of fats per diem, instead of 24 grams as provided in the new ration and 50 grams in the old. If the negotiations with the Germans to protect the whole of the meat and cattle in Belgium are successful, there can be no reasonable objection to our importing fodder, bacon, lard, etc., on the old basis. There has just been brought to our notice a decree issued by the German Government in Belgium commanding the seizure of all raw or manufactured wool. All the stocks of these articles must be declared to the German authorities by the 15th of February under heavy penalties, and the whole must be sold to the German purchasing association at Brussels (Kriegswollbedarf-Aktiengesellschaft). This decree coming some time after our demand that the export of textiles from Belgium should be prohibited, and synchronizing with General von Bissing's reply to our demands recently presented by the Marquis Villalobar, which totally disregards this particular condition, creates the very gravest situation, and we have no choice but to take appropriate measures at once. We must therefore ask you to stop absolutely, until the revocation of the decree, all imports by you of clothing materials into Belgium. I am sending a copy of this letter to the United States Ambassador, the Spanish Ambassador, and the Belgian and Netherlands Ministers. While the matter of clothing imports was still in suspense the Commission by strenuous efforts secured an acutely needed increase in the "permitted imports." This increase the British granted after the Germans had been brought to agree to stop the shipment of animals, produce and fodder from Belgium to Germany and after Hoover had shown the Foreign Office the disastrous effects on the Belgian civilians of the recent import restrictions. Condensed milk (for children) 500 . . . . . . . .
1. The enormous effective increase in impoverishment due to the extraordinary rise in prices in native foodstuffs during the last three months. 2. The diminution in local supplies of potatoes, etc., and the necessity for supplying a wider social area with substitutes. The commodities other than flour are issued from our magazines upon cartes de ménage (specimen of which is attached), this being issued by the local committees to those members of the communities either destitute or of limited means. The number of cartes de ménage had gradually increased during January and February and in your order to thoroughly revise the whole position and reduce consumers to a number comparable with those included in your order of February 23d, the old cards were called in and a new set issued, but despite all restrictions on the issue the total of these new cards outstanding is a little over 5,000,000. This means that the ration calculated above for the 3,250,000 is being spread over 5,000,000 and the increases proposed above are mostly to carry out mathematically the increased social range necessary to cover, with the exception of rice, which had to be eliminated from the previous program and which has now become absolutely critical owing to shortage in potatoes. The legal maximum has been taken off meat prices in order to induce more meat to come into the market. As a result the price of meat has risen to Fr. 2.90 per kilo on hoof or equal to approximately Fr. 8 per kilo dressed. Also the prices of lard and bacon have risen in Brussels to from Fr. 12 to Fr. 15 per kilo in the shops and are not always obtainable (our price in the sale of rations being Frs. 2.20). The partial requisition of fodder crops and the suppression of our fodder imports have led the peasants to feed potatoes to the cattle, partly in order to preserve them alive for cultivating the fields and partly to fatten for the market. A vicious circle has thus been set up, which has rendered what would have been an adequate supply of potatoes wholly deficient. Many towns, particularly the industrial centers, are now out of potatoes or only receive intermittent amounts when forced out of the peasants by requisition of the German authorities, for the peasants, in fright for their cattle feed, are withholding them from the market. In any event, it appears certain that the intermittent supplies will become totally exhausted after May 1st in larger cities. Some have been shipped from Holland, but I am informed that the surplus there is probably exhausted. The actual number of people on the Secours lists receiving assistance to purchase their rations is not increasing perceptibly, but the long continued stagnation and extravagant rises in prices of native food supplies is at last hitting the middle class very hard and they are becoming more and more dependent upon cheaper priced imports in order to make ends meet. We simply cannot decrease the numbers of our issued cartes de ménage and the result of spreading the original ration, which was of a very limited nature, over so large a number and area would make acute suffering, especially in industrial centers. The town of Charleroi organized a deputation of 100 people to go to Brussels and present their position. Their petition was refused, but nevertheless the statement they made was of the most pathetic order and they are corroborated by our own investigations. In the matter of the importation of yeast materials, I would call your attention to the fact that it takes about 2,000 tons of yeast per month to bake the Belgian and French bread, and to make this would require about 3,000 tons per month of materials. We are getting some yeast from Holland, and have some local supplies of barley, which have been set aside by the proper committee for this purpose. We can get along now if we can import about 1,000 tons of stuff for this purpose, and experience shows that we can use maize to some extent in this work, so that we should like to choose our own cereals according to our abilities to secure supplies. As regards potatoes, there is, I am informed, a large abundance in Ireland. We might arrange to import some into Belgium and Northern France. The normal consumption of potatoes for Belgium and Northern France would be over 100,000 tons per month, and even if we could get but a small part of this distributed, in the acute condition of the situation it would help to stem the outbreak of scurvy or other diseases until such time as other green vegetables come in at the latter part of June. I am not raising the question of fodder imports, as it appears to us too late to do any good and shipping to handle such imports seems almost unobtainable. The people do need feed for their chickens for the next two or three months. We are organizing an arrangement whereby the fodder received from milling maize and wheat will be distributed through the communal committees only to such peasants as supply in return actual milk to the communal authorities, so as to endeavor to bring down the necessity to import condensed milk for the children; and if we had some fodder we might introduce an egg control of the same nature. I do not, however, think we need trouble with this latter matter at the present moment. I have been to Northern France to investigate present conditions. There have been three causes in operation militating against our revictualment of this region. 1. Reduction of permitted quantities, as per your direction of February 23d. 2. Failure of native food supplies. 3. Shortage of overseas transport. We strongly recommend that all cereals should be made interchangeable, including wheat, as well as those of secondary importance since this gives us vital flexibility in issuing rations. During the month, we were unable from lack of transport to deliver the full amount of flour, the actual ration imported being 200 grams. The sugar was restricted to a 10-gram ration and the condensed milk, owing to inability to purchase, to under 1,000 tons total. We had in stock at Rotterdam and could have delivered more bacon and lard and subsidiary cereals, but of course could not do so under the restrictions. You will recollect that the quantities specified in the order of February 23d meant a very serious reduction from the previous program, a reduction which had, of course, to be expressed in reduced rations to the people. The occasion which now obliges us to ask for increases is not only due to the effect of these reductions but also to the practical exhaustion of meat, potatoes, and other local supplementary articles. It is insisted to us that the population simply cannot be maintained in health on less than an average of 2,400 calories for the total population. Our proposals, as above, increase the imports to 2,100 calories, leaving something to be made up by such local supplies as we may be able to assemble. With the assistance of Messrs. Poland, Whitney, Wellington, and Richardson of our staff, I undertook an examination of the condition of the people in the cities of Lille, Valenciennes, and Roubaix, and the surrounding territory and districts, which comprise within an area of 1,235 square miles a present population of 1,260,000 civilians. We inspected the public markets, abbatoirs, provision shops, and meat shops, held conferences with the communal and municipal authorities of the larger cities, and moved freely over the district generally. Messrs. Wellington and Richardson are permanently located in the district, Mr. Whitney having general charge and spending a large part of his time there. a) The shops that have recently and openly sold dog meat, now closed by the authorities. b) A little Dutch meat, which reached Roubaix. Only two sides were exposed for sale in the whole town, the vender demanding an average of Fr. 12 per kilo, bones and all---about 5 shillings per pound. c) Some meat that had been obtained by special exertions for the soup kitchens. As showing the scarcity under this heading I may say that during 12 days of 16, in one commune, there had been no meat or grease base whatever to the soup. We are doing our utmost to get a small amount of meat from Belgium and Holland for the soup kitchens, but the utmost we can hope for is only equal to 10 grams of meat per day per capita and as to this we are almost in despair. Incidentally, two of our party endeavored to obtain dinner in Lille, and after visiting four restaurants which had no meat, they found one where the proprietor was able to offer a single chicken at Fr. 16. Potatoes---The potatoes throughout the region are absolutely exhausted. One hundred kilos were offered in the Valenciennes market and sold for Fr. 85 (£34 per ton, as against £4 normal). The German authorities originally supplied 200 grams per capita per diem, but as the exhaustion of the supplying districts extended farther and farther afield, in both Belgium and Northern France, these shipments became first intermittent and finally negligible. We tried to get some potatoes from Holland, but failed. The food value of the small quantity of potatoes desired is of course of less importance than its value in preventing the spread of scurvy. In every case among the numerous provision shops visited the shelves were absolutely bare. There were a few surviving articles de luxe displayed but they were obviously of no food importance. The total number of food animals seen in our whole journey was four cattle and fourteen chickens. The population receives no milk and buffer supplies, and a package of Dutch margarine sold recently in Lille for Fr. 16 per kilo. We saw no vegetables in the markets apart from a little celery and a good deal of dandelion leaves. It is obvious that the population are dependent upon our imported ration, and it is clear that the March basis will not support life. The mortality statistics for the city of Lille for the past four months show an increase from 20 in December to 42 the first 25 days of March. Sickness has increased far beyond what the figures for mortality so far indicate and will be reflected in the more serious mortality statistics of later months. In Roubaix riots broke out in one of the poorer communes upon the announcement of the reduction in the ration, and I am informed by the German authorities that they removed 2,000 men from the town to work for them in order to preserve tranquillity. They stated that these men have been sent to other districts to work on the roads. There are no consequential leakages in the distribution. The goods all go to the communal magazines under seal and the mayors themselves report their arrivals and quantities to the American district managers and they, in turn, to our central organization. Every household has a carte de ménage issued by the committees, and this card entitles the holder to purchase or gift of the ration. The ration is posted publicly everywhere. As the population must starve or get the ration, they get it. Moreover, as it is less than life can endure upon, they do not part with it. The people are free to complain to the American district managers, and the Americans are in constant motion visiting the people. An indication of the tenacity with which the people cling to their pittance lies in the disparity in price of free lard (when obtainable), which is Fr. 15 per kilo, against our lard ration, where sold, at Fr. 2.20 per kilo. In conclusion.---I feel my entire inability to draw for you an adequate picture of the unutterable depression and despair of these people. We are the only link to their kindred and their allies, and we are thus the only mouthpiece by which they may express to you their prayer for more help. My colleagues and myself feel that when the result of our representations last month was a reduction in their food instead of an increase as pleaded for, we have today to recognize that we have but proved our incapacity as their advocates. The Allies have not fought this war, nor do they intend to fight it, on the basis of abandonment of solicitude for the helpless; yet we, who for over a year have been ceaselessly endeavoring to alleviate this mass of misery, are now forced to appear as an instrument of torture, since daily we must refuse the pleadings of a people whose sufferings will yet be told in terms reflecting neglect for which we are now daily blamed. With reference to the letter addressed by you to Lord Eustace Percy on the 5th instant, pointing out the scarcity of certain foodstuffs in Northern France as a result of the recent reduction in the ration, I am directed by Lord Robert Cecil to state that His Majesty's Government have decided, in view of the considerations urged in your letter, to agree to the increases for which you ask, namely three thousand three hundred tons of flour, one thousand six hundred tons of bacon and lard, and two thousand two hundred tons of rice per month. His Majesty's Government further agree that all cereals shall be made interchangeable, including wheat. His Majesty's Government must however insist that the German authorities should furnish the two hundred grammes of potatoes per capita per them as originally promised. I have the honor to inform Your Excellency that I have submitted to the Governor-General the note which His Excellency the Minister of Spain was so kind as to send me under date of April 7th, 1916, in the name of Your Excellency and of the Chargé d'Affaires of the Netherlands, as well as in his own, concerning the ravitaillement of Belgium by the Comité National de Secours et d'Alimentation. The Governor-General has instructed me to convey to Your Excellency his gratitude for the constant solicitude which you have never ceased to show during the past 20 months, for the humanitarian labors of which you kindly accepted the patronage in conjunction with His Excellency the Minister of Spain and the Chargé d'Affaires of the Netherlands. The Governor-General is persuaded that the entire Belgian population share these sentiments. The Governor-General has noted with much pleasure that the steps taken by His Excellency the Minister of Spain in the name of Your Excellency and of the Chargé d'Affaires of the Netherlands, as well as in his own, have been successful in persuading the English Government not to stop the ravitaillement of the civil population in Belgium. His Excellency has shown himself all the more completely satisfied with this result in view of the fact that the new demands recently formulated by the English Government, which constituted a serious menace to the continuation of this ravitaillement, were based on erroneous information to the effect that the authorities in the territory administered by the Governor-General had not respected the promises made by His Excellency to the neutral Powers. Your Excellency is in a position to know that this assertion is untrue, and to confute it easily. In fact, the Governor-General remembers with satisfaction that Your Excellency, as well as your honored colleagues, have recognized on numerous occasions, last of all in your note of January 23d, 1916, the correct attitude observed by the authorities under his orders in the execution of the agreements entered into by him. In view of the fact that the Governor-General recently even showed his readiness, in despite of certain German interests, to renounce the right, incontestably his by the terms of the Convention of The Hague, to provision the army of occupation with Belgian supplies, Your Excellency will infer the interest which the Governor-General feels in the well-being of the population of the country which he governs. As a result of the negotiations of last February, and contrary to the information received by the English Government, the Governor-General has already issued, under date of March 1st, a regulation forbidding the exportation of foodstuffs and fodder. In accordance with the general import of the assurances last given the Government which Your Excellency represents, the Governor-General will resume and complete the measures already taken in this direction by new instructions forbidding the exportation from the territory of the General Government of foodstuffs (including animals), produce, and fodder, serving for human alimentation and animals. He will forbid, moreover, the exportation from said territory of seeds, fertilizers, and agricultural supplies. This prohibition will apply only to products of Belgian origin, it being especially understood that products of German origin which are now in the magazines of the military government, may be exported. Aside from the authorizations which may be accorded the Commission for Relief in Belgium for exportation, from the territory of the Governor-General to the north of France, of food, animals, and fodder, of which there may be a supply more than sufficient for consumption, there will be no exception to the above prohibition; the reservation agreed to by His Excellency the Minister of Spain with the English Government being, however, made in this case for quantities of certain products of the Belgian soil which are more than sufficient for the needs of the population of the occupied territory of Belgium. The Governor-General will give also to the Military Commissariat of the General Government, to ensure the success of the enterprise (pour les effects conséquents), instructions no longer to requisition, or buy freely, in the occupied territory of Belgium, for the needs of the army of occupation, any of the products mentioned above. As Your Excellency has certainly been convinced in the course of the recent negotiations, the Governor-General attaches greatest importance to the creation of a definite and clearly understood situation. It is therefore with great satisfaction that I have inferred, from the note which His Excellency the Minister of Spain was so kind as to send me, that Your Excellency, in the capacity of representative of your Government, will not consider occasional purchases of these products made individually by persons belonging to the army as contrary to the engagements entered into by the Governor-General, provided that these purchases are not at all systematic (aucunement systématique), and are not made for the account of the Military Commissariat. Having thus extended the scope of the obligations entered into by him previously toward the three neutral Powers, for the territory, which he governs, the Governor-General is persuaded that, on its side, the Government which Your Excellency represents will assume toward him the guarantee that the British Government will henceforward definitively renounce the practice of interfering by requisition of ships, or in any other manner, with the ravitaillement of the civil population in Belgium. I hope that Your Excellency will secure from your Government authorization to confirm the justice of this position. Your Excellency is in a position to know that the stipulations of this agreement, and of all those previously concluded with the Government which Your Excellency represents, are conscientiously observed by the authorities and the troops under the orders of His Excellency. The Governor-General is always ready to aid Your Excellency in every possible way in the accomplishment of this task. He ventures to express the hope that Your Excellency will kindly make known in the neutral and belligerent countries the evidence which you already have, and which you may later secure, in this connection, in order to refute the interested insinuations which are constantly appearing in these countries, and which can only result in harm to the enterprise of which you have kindly assumed patronage. In his anxiety to keep this enterprise free from all unjustifiable interference from the Powers at war with Germany, and in his desire to avoid all dealings with the latter, the Governor-General will continue to apply to Your Excellency in all questions connected therewith. The Governor-General has noted with satisfaction that Your Excellency will see to it that the work of Secours and Alimentation placed under his patronage be kept strictly within the limits traced for its activity. This will permit the Governor-General to give, as in the past, all his aid and all his protection to the Comité National and the Commission for Relief in Belgium under the patronage of Your Excellency, in order to permit the members of these two organizations to continue the work which they have been doing up to the present with such devotion in their humanitarian and charitable enterprise, destined to lighten for the population of Belgium the weight of the sufferings occasioned by the war. I take this occasion to renew the assurance of my profound respect. I have the honour to acknowledge receipt of a communication which Your Excellency was good enough to address to me on the 26th ultimo, enclosing a copy of a note addressed to the United States Minister at Brussels by Baron von der Lancken on behalf of the Governor-General in Belgium replying to the proposals that have been advanced by His Majesty's Government in regard to the prohibition of export of foodstuffs from Belgium and other matters. I now have the honour to transmit to Your Excellency herewith a memorandum embodying the views of His Majesty's Government in regard to Baron von der Lancken's communication, and I should be grateful if Your Excellency would be good enough to cause a copy of this document to be communicated to the neutral Ministers at Brussels who are acting as patrons of the Commission for Relief in Belgium. His Majesty's Government note with satisfaction that the Governor-General in Belgium undertakes to prohibit the export from territory within his jurisdiction of all foodstuffs and feeding stuffs, including seeds, fertilisers, and agricultural stock of all kinds, the only exceptions being (1) that the export of stocks of the above commodities of German origin may be allowed, (2) that the Commission for Relief in Belgium will be permitted to export to Northern France such food, cattle, and fodder as constitute an excess over the internal consumption in Belgium, and (3) that certain native Belgian products of which there is an admitted surplus may, on the basis of the letter addressed to the Marquis of Villalobar on March 21st last, be exported from Belgium. As regards any surplus of commodities other than those specified under head (3) above, which may arise owing to the measures promised by the Governor-General, His Majesty's Government note that Baron von der Lancken's communication contains no reference as to their disposal other than that they may be utilised, in so far as they are required, for export to Northern France. His Majesty's Government had, however, stipulated that the Commission for Relief in Belgium should be allowed to exercise any control over such stocks which may be necessary in order to conserve them for the future or to make them available for the present needs of the population. It will therefore be necessary, in the interests of all parties concerned, to set up some form of control over the native produce of the forthcoming season similar to that arranged in 1914 in regard to breadstuffs, such control to include all the livestock and dairy produce in the country; the bodies entrusted with this control will be in the best position to determine what commodities are in excess of the needs of the population. His Majesty's Government are further glad to note the Governor-General's declaration that he will give orders to the quartermaster's department that none of the Belgian produce mentioned in the second paragraph may be either requisitioned or purchased for the use of the occupying army. In return for this assurance His Majesty's Government now agree to raise no objection to the incidental purchase by individual soldiers of Belgian native produce, provided that such individual purchases are not in any way systematic and do not, in fact, come in any way within the purview or control of the quartermaster's department or any other military authority. Baron von der Lancken's communication contains a passage in which the hope is expressed that the United States Government will give the Governor-General a guarantee that henceforward the British Government will finally abstain from impeding, either by means of the requisitioning of ships or in any other manner, the revictualing of the civil population of Belgium. His Majesty's Government must in the first instance emphatically deny that they have ever taken any measures for impeding the revictualing of the Belgian population within the limits to which they have agreed; they have always been desirous of co-operating in the most open and cordial manner with the Commission for Relief in Belgium, in whose operations they repose complete reliance, and though they have been obliged at certain times to requisition British ships which the Belgian Relief Commission desired to employ this has been done to meet the urgent necessities of the moment and to ease some temporary shortage of freight, for the existence of which they cannot be held responsible. As has already been pointed out in the memorandum communicated to the Marquis de Villalobar on February 28th last, His Majesty's Government regret that they cannot relinquish their sovereign right to requisition at any time any ship flying the British flag. Subject to this reservation, the Commission may count on continuing to receive in the future as they have received in the past, the loyal co-operation and assistance of His Majesty's Government in the great humanitarian work which they have undertaken, and it is hoped that the consideration which may have inspired the requirement of the German authorities in regard to requisitioning, will be favourably affected by the negotiations at present in progress for the use by the Relief Commission of German interned vessels. The Belgian Minister at this Court and the Commission for Relief have recently pressed upon me extensive proposals for the increase in the present rations. After a careful examination of these proposals and acting on the assumption that the undertakings given by the Governor-General in Belgium will rapidly be carried into effect, His Majesty's Government have decided to increase the rations in the sense desired by the Commission. It will of course be understood that the continuance of the rations on the higher scale must be dependent on the exercise of a control over native Belgian produce on the lines indicated above. Four thousand tons of bacon and lard per month (instead of 2,400 tons), 5,000 tons of rice (for which there was no previous allowance), and 1,000 tons of yeast materials per month (instead of 250 tons). No objection will be raised to making all cereals interchangeable, provided the actual imports of maize are not allowed to exceed 8,000 tons per month and provided it is clearly intimated to this Office on each occasion when it is proposed to substitute one cereal for another. The rice will of course be cleaned rice. As regards your proposal to import potatoes from Ireland, Lord Robert Cecil would be glad to be informed in the first instance what is the maximum quantity which the Commission would propose to ship per month, so that enquiry may be made in the proper quarter whether the amounts can be spared from this country. This authorization to increase imports represents the successful termination of difficult negotiations with the Germans on the one hand and the British on the other, with the continuation of relief to the Belgians in the balance. These negotiations illustrate the part which the C.R.B. played as the neutral representative of Belgian interests which were repeatedly threatened in the struggle of the British to maintain and the Germans to break down the blockade. The permission given to consider cereals interchangeable was of great practical importance, since it was difficult and sometimes impossible to purchase monthly specified quantities of maize, beans and peas, and rice, as these commodities came into the market at various seasons and there were times when at least one of them was quite unobtainable. On December 31st last I had the honour of communicating to you certain demands which His Majesty's Government felt obliged to make on the German Government in connection with the Commission for Relief in Belgium. Among other things, I then demanded the prohibition of the export of all clothing and clothing materials from Belgium, and at the end of my note I said that, unless the German authorities would consent to what I regarded as the reasonable demands of the Allies, I should be obliged to publish the correspondence regarding the Commission's work. On March 14th I was obliged to inform you that owing to the seizures of textile materials carried out by the Germans in Belgium I could no longer allow the importation of clothing and clothing materials by the Relief Commission into Belgium, and I expressed my astonishment that these seizures had been put into force at the very moment when the demands of the Allies were before the German Government. Since that time the German Government have acceded to the demands made in my note of December 31st, so far as foodstuffs, fodder, fertilisers, and agricultural stock are concerned, but they have refused to yield in any way to the demand regarding clothing materials. If it were not that special considerations arise in regard to stocks of clothing already collected by the Commission, I should have been obliged to make permanent the embargo on these stocks, but I cannot forget that they are the product of appeals for contributions of this kind made by the Relief Commission in the United States last Autumn, and His Majesty's Government are most reluctant to defeat the charitable endeavours of the American public who answered these appeals. I have therefore informed the Commission that His Majesty's Government raise no objection to the importation into Belgium of certain stocks of clothing already in their possession at Rotterdam, in England, and in the United States, to be distributed under the strict system of control guaranteed by the Commission, but, in view of the German seizures above mentioned, no further anthorisation of this kind can be given and, from now until the end of the war, the Allied Governments must impose an absolute prohibition on the importation into Belgium by the Relief Commission of clothing or clothing materials of any kind unless and until the German Government reverse their recent policy and restore to the people of Belgium the stocks of such materials which they have taken from them. In accordance with the statement made in my note of December 31st I am taking steps to publish the present communication immediately for the information of all those interested in the condition of Belgium. It seems to me desirable to review the probable clothing situation, assuming that we are to go on with this business until next summer. Belgium.---We have a considerable stock of clothing goods and ready-made clothing in Belgium at the present moment, as a result of the sudden introduction of the shipments which have been so long held up. It is our belief that if we could import secondhand clothing to supplement this supply we should be able to eke out our textiles for Belgium for the next eight or ten months. Secondhand clothing is an advantage in that it gives more work for the ouvroirs, which are distributed around over the country, than would piece goods; and in any event, by working the two up together we could extend the situation to much greater effect. Therefore we need to have the ban on Belgium removed to the extent that we might import secondhand clothing. The question of shoes for women and children is one of the most distressing situations we have to meet at the present time, more especially for children under 6 to 7 years of age, for whom the use of sabots is, on medical grounds, almost prohibited. In Brussels alone, a canvass of the schools to determine the number of shoes which are absolutely required showed something like 80,000 pairs needed against something under 15,000 pairs available in our present supplies for distribution. Our idea is, if you agree, that we should purchase and import a certain amount of ready-made shoes for women and children, that we should endeavor to secure secondhand shoes and that we should import a certain amount of leather for their repair, as the various ouvroirs each has a shoe-repair shop and can pass out a great deal in this way. Northern France.---There is no prohibition of the import of either clothing materials or shoes for women and children here, and we are anxious to purchase a further supply of textiles to be made up in Northern France. We laid this matter before you some time ago, and, as I understand, the only point at issue is whether or not we should be allowed to purchase the materials in and export them from this country. I beg to hand you herewith copy of a letter sent to Mr. Chevrillon concerning secondhand boots. These are discarded military boots which are being collected and worked over in order to make them suitable for the peasantry. I am sending you a pair in a separate package, to show just the character of the worked-over product. They are considered entirely unsuitable for soldier wear, but would supply a very great need for farm laborers, etc., in Northern France. We should like to know whether this worked-over stock would be considered by the Foreign Office as proper to send into Northern France, even in view of the interdiction in regard to shipments of military boots. With reference to your letter of October 12th about military boots for Northern France, I return the samples to you herewith. I am afraid the decision of our military experts is that both these boots would be very useful to the Germans and that they should not be allowed to go anywhere within reach of the Germans. You should bear in mind that the present condition of German soldiers' boots makes it very unsafe to assume that nothing that is not a distinctively military boot will be of service to them. We believe at least one of the samples would be a positive godsend to many German regiments. 1. With reference to previous correspondence regarding fifty-six thousand pairs of men's boots which you now have at Rotterdam and which you desire to send into Northern France, and further with reference to your letter of November 18th regarding one hundred thousand woolen blankets for Northern France, I am directed to inform you that at the express request of the French Government we are now prepared to allow the importation of these articles. 2. Both boots and blankets should if possible be stamped or branded or otherwise labelled in some indelible way, and every precaution should be taken and every possible guarantee exacted from the Germans so as to ensure that none of these articles are used for any other purposes than for the destitute civilian population for whom they are intended. You should also take all possible measures to see that these importations do not in fact constitute replacement of goods now in Northern France which might be taken by the occupying authorities for their own use. In spite of the troubles which hampered the fulfilment of the program in 1916, the Commission had during its second year placed in Rotterdam 1,300,000 tons of supplies, valued at $116,000,000. Monthly imports varied as a result of the restrictions of the British authorities. Thus in March 1916 only 64,000 tons were imported, as against a monthly average for the year of 106,000 tons. (56) Gifts in kind, as had been anticipated, had fallen to 13,249 tons. This was in part due to the Commission's policy, in the face of new conditions, of emphasizing the need of financial assistance rather than of gifts in kind. Appeals for used clothing were an exception to this policy.